Billy Wagner didn’t have a Hall of Fame career, but he was a pretty good closer for a long time. In a 16-year career, Wagner earned 422 saves and went to the All-Star game seven times. So I was a little surprised to find a pair of autographed baseball cards in a five-for-$10 box along with the likes of Jorge Toca and Geoff Getz at the collectibles shop I visited in Pennsylvania earlier this month. 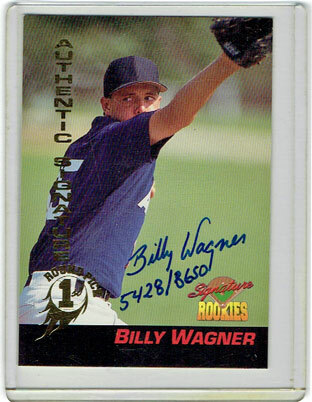 Wagner’s first certified autograph came in the 1994 Signature Rookies set, released a year after the Houston Astros made him the 12th overall pick in the amateur draft. Can you believe Signature Rookies asked him to sign 8.650 of these cards? Classic, best known for making a series of trivia games that featured baseball cards in the late 1980s, also made a foray into producing minor league baseball card sets and pack-based “prospect” sets in the early 1990s. Wagner signed an unannounced number of these inserts for a set that included players from five sports in 1995. We’re certainly not looking at the most attractive baseball cards, but it’s hard to go wrong if you’re getting them for $2 a piece.